We are very pleased to have Bird and Hopper Farm present 2 fermentation demonstrations on Friday September 28 at the Market. The first will begin at 10 am, the second will start at noon. 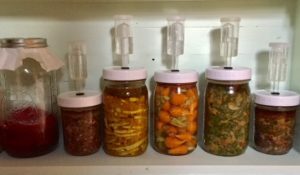 Fermentation kits will be available for sale. Fermentation is a very old method of food preservation. It has been around since the neolithic age. Modern pickles rely on the addition of vinegar to lower the ph of canned pickles and salsas to preserve them. Fermentation relies on chemical reactions caused by yeasts and bacteria. From Wikipedia: “fermentation is used for preservation in a process that produces lactic acid as found in such sour foods as pickled cucumbers, kimchi and yogurt (see fermentation in food processing), as well as for producing alcoholic beverages such as wine (see fermentation in winemaking) and beer. Fermented foods have the added benefit of supplying healthy bacteria to your stomach. Interest in fermentation has increased as we learn more about the importance of good gut health. Donna and Carrie have been vendors for 5 years and come all the way from Floyd to be part of the Market. They grow produce, raise Icelandic sheep for wool, and bring canned and baked goods to Market. They also create handmade ceramic buttons. In addition, Carrie is an architect and has donated her talents to help with the design of Town Park. She presented her plan at the first public hearing and was well received by the town council. Stay tuned for updates and dates for upcoming public hearings! This entry was posted in Events, Market Day, Recipes and tagged cooking demonstrations, fermentation. Bookmark the permalink.